Akit's Complaint Department: Caltrain Monthly Pass Users - Ready for Clipper? One big change coming for Caltrain monthly pass users is the mandatory transition to Clipper starting with the March pass. You can now pre-purchase your pass now at in-person retailers or automated machines, or purchase it online as soon as you can to not become a victim of the five day policy. If you don't have a card, you can get one for free at in-person retailers or request one online. There are not many locations along the Caltrain corridor with in-person Clipper retailers. There are no add value machines at stations. If you frequently go to the 4th and King station, there's a Walgreens next door that can help you add value. Consider the autoload program as an alternative. The card must have at least $1.25 in e-cash value. It might not make sense to you, but trust me, if you have less than this amount, you are in trouble. On the first day of use for the new month, you must tag your card at the starting station and tag the card at your ending station. This will program your card as a valid pass. Once the card has been activated on its first trip, you don't need to tag-on and tag-off at your start and end stations. Show the inspector the card and his/her reader will tell him/her what zones you are allowed to travel. For riding further than your designated zones, purchase a paper upgrade ticket and show it to the inspector upon request. When purchasing a Muni pass add-on, you can do so when you do you purchase your pass. Transfer agreements are honored with VTA and Samtrans when you have a pass with two zones or more on your Clipper card. Just tag your card on the bus or light rail platform reader. Monthly parking permits can be purchased at Caltrain paper ticketing machines. You'll need your Clipper card serial number for the system to verify you purchased a valid pass. That's the basics. If you want a comparison on the transition from paper to electronic passes, click here. 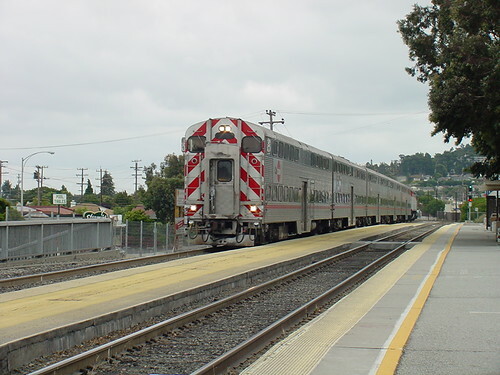 For more tips about properly using Clipper on Caltrain, click here. "On Saturdays, Sundays and holidays, the pass will be honored for unlimited trips between all zones." (http://www.caltrain.com/Fares/tickettypes.html -> § Monthly pass) will be still valid with a monthly pass on a Clipper Card ? The paper pass policies still apply to Caltrain passes on Clipper cards, just like the inter-agency transfers between Caltrain and VTA & Samtrans.